Hollows, solids, foundation and chimney blocks to mention only a few examples. ZENITH model 913, the ideal concrete block making machine for economical mass production of high quality concrete blocks. Available in semi and fully automatic execution. Outstanding performance in open area or buildings. Safe handling and well proven design principles guarantee efficient operation of ZENITH model 913, even still in decades. Different moulds are easily interchangeable. 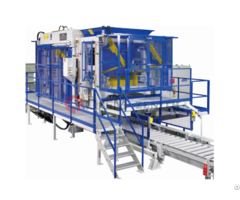 The machine produces concrete elements directly onto the ground, in lines – cycle by cycle. Running wheels of machine are outfitted with Vulkollan coating for protection of concrete floor. Equipped with hydraulic shunting wheel for turning of machine at end of production lines. More than six thousand machines of this type are in operation worldwide. 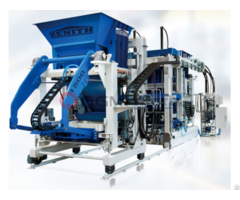 ZENITH offers for all travellers comprehensive equipment for concrete block handling. Cubers with special clamps are available. 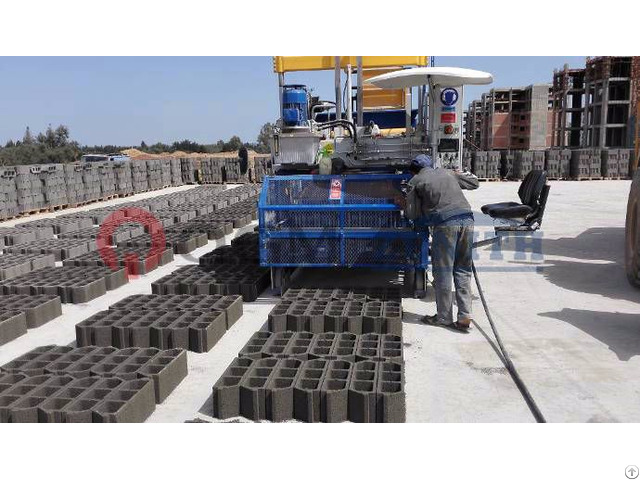 Transport of fresh concrete from batching and mixing plant to block machine is preferably made with a forklift equipped with a hopper or with a special concrete loader. Ask ZENITH for the options available.Safety and quality are guaranteed by ZENITH providing original ZENITH parts are used.